People working and living on a ship create waste such as garbage and sewage. This needs to be managed carefully to avoid pollution of the oceans and seas. Ships engines also produce waste when they are in use powering the ship around the globe. In the past, it was thought that the oceans could absorb anything that was thrown into them. And many items, such as paper and foodstuffs will be broken down and degraded by the seas, so they wouldn’t become a pollution problem. But for some items, this process can take months or years. A plastic bottle thrown into the sea would take 450 years to disappear completely. Plastics can float on the surface, pushed along by ocean currents and washed onto beaches. Heavier garbage can sink and gather on the sea bed, creating dangers for marine life. Fish, turtles and jellyfish can mistake bits of plastic for food. When they try to eat it they can choke and die. Other objects, such as discarded fishing ropes and nets, can trap marine mammals. IMO has some regulations that ban garbage and rubbish being thrown or discharged from a ship into the sea, except for organic waste such as food scraps. These regulations have been agreed internationally and are known as the International Convention for the Prevention of Pollution from Ships (MARPOL). 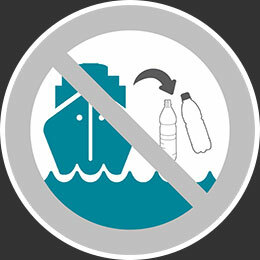 Other IMO regulations prevent pollution of the seas with sewage from ships. Raw sewage looks dreadful and can create a health hazard, as well as leading to oxygen depletion with an effect on marine plant and animal life. Far out to sea, the oceans themselves are able to break down and deal with raw sewage, through natural bacterial action. So the IMO regulations don’t allow sewage to be discharged from ships into the sea if they are too near the land, unless they have their own sewage treatment plant on board the ship. Some cruise ships have very sophisticated sewage treatment plants on board, so that water can be recycled and reused. We can all help the environment by re-cycling things we use, by re-using them, and by reducing our use of disposable materials. The crew on board ships are encouraged to do this as well. And Governments around the world have a duty under the IMO to provide facilities within each port to receive any garbage, sewage or oily engine waste. These are called Port Reception facilities. Have a look at this article about dealing with waste and garbage at sea. List as many types of garbage that you can think of that might end up in the sea. Against each type, say how you think it got there. Produce a poster or powerpoint presentation about this.